Surprised? Don’t be! According to the recent Android fragmentation data (June 2015) report, almost 12.4% of Android devices are running Lollipop version. Google collected this data through their Google Play app. It is to be noted that this is the first time Lollipop passes the 10% mark. We are here, talking about Google’s latest Android version ‘M’, but still looking back at the numbers, I’m worried about the future. When will my smartphone get Android M? After Google announces the successor of Android M? 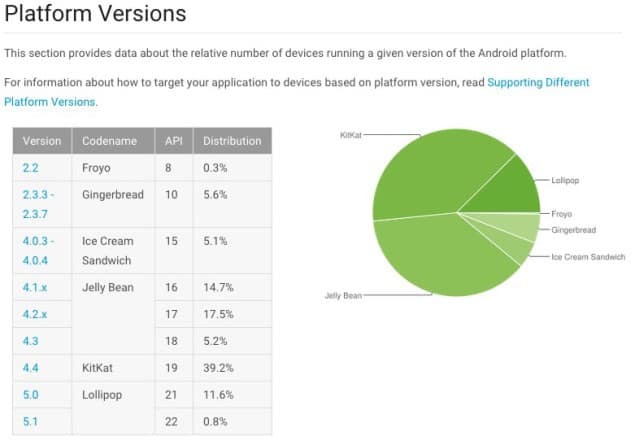 Majority of the Android devices are still running KitKat and seems like they’ll be upgrading directly from “KitKat” to “Android M” without tasting Lollipop. Google’s latest Android version ‘M’ is installed on just 0.8% of all Android devices, but of course, it should be only limited to Nexus devices for the time being. Android M is available as a Developer Preview and you can install it in your Nexus device. Want To Make Your Mac Say What You Type? Explained: What Is Stock Android?